Classical scholar M. I. Finley (1912-1986) was involved in many of the momentous intellectual, political, and social issues and debates of the 1930s and 1940s. He came to the study of the ancient world by a circuitous route, graduating with a B.A. in psychology from Syracuse University in 1927 (at age 15), an M.A. in public law in 1927 and a PhD in history in 1951 (both advanced degrees from Columbia University). Between his M.A. and Ph.D. Finley worked briefly at General Motors, was an editor of the groundbreaking Encyclopedia of the Social Sciences, fought against Nazi race theories, and organized Russian relief during World War II. 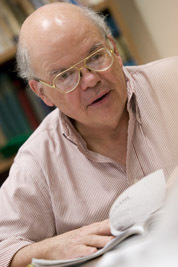 Finley was in contact and collaborating with thinkers like Franz Boas, Karl Polanyi, and members of the Frankfurt School at the Institute for Social Research. When finally his dissertation, “STUDIES IN LAND AND CREDIT IN ANCIENT ATHENS, 500-200 B. C.: THE HOROS-INSCRIPTIONS,” landed him a faculty position at Rutgers University, he was forced out due to his left-wing political affiliations. He appeared before the McCarran Committee (United States Senate Subcommittee on Internal Security) in 1952 and pleaded the Fifth Amendment when asked about his affiliation with the Communist Party. Finley took a position in Classics at Cambridge University and eventually became a citizen of the United Kingdom. As a scholar, Finley brought his own contemporary concerns and interests to questions about the ancient world. 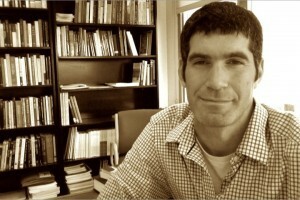 His research on ancient slavery and economy, and democracy and culture, resonate with the intellectual and social struggles of the mid-20th century. Professor Daniel Tompkins is researching the life of Moses Finley. I spoke to him on December 15, 2015 in my office. On March 18, 2013 I spoke with three Temple classics majors about the archaeological digs they participated in during the summer of 2012. Andy Pollack was at the Temple University field school in Artena, Italy, working on a Roman villa; Eamonn Connor was a volunteer at the ancient agora near the Acropolis in Athens, Greece; and Samantha Davidson attended the Davidson College field school at a rural site in Atheneiou, Cypus. We met in my office at 8 AM. With coffee in hand, we had an interesting conversation about the similarities and differences between the three sites. We talked about artifacts, preservation, tools, the daily routine, and the surrounding geography and history of each site. A palimpsest is a “a manuscript or piece of writing material on which later writing has been superimposed on effaced earlier writing” (From The Oxford Dictionary of English). The Archimedes Palimpsest Project involves the rediscovery of seven texts of Archimedes scraped from the parchment later became a Byzantine prayer book. Advanced imaging techniques have been used to tease the ancient Archimedean texts from the parchment. This web site contains a wide rage of material–straightforward descriptions with video, scholarly analysis, and scientific details. Try out the free audio books on LibriVox. You can listen to them on your computer, iPod, or MP3 player. I just downloaded the Anti-Federalist and the Federalist Papers to iTunes and plan to listen to them when I get a chance. These are works I’ve been meaning to read forever. I’ll try to listen to them instead. I searched the catalog a bit and discovered audio works of Descartes, Plato, Martin Luther, Augustine, Aquinas, among others.